All leads are sold separately as we do not know what you want to connect to. Power: 9V DC (regulated or unregulated) – never apply more than 12V(never use an unregulated supply greater than 9V as unregulated supplies typically give a higher output than shown). 9V switch mode power supply included. 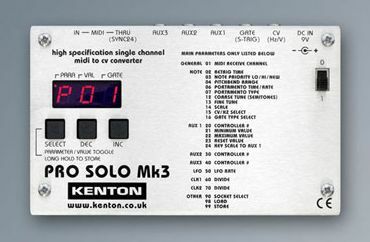 Products bought directly from Kenton are supplied with the appropriate power supply for the delivery address. Four types are available, UK / EU / USA / Australia. What's new or different about the Mk3?